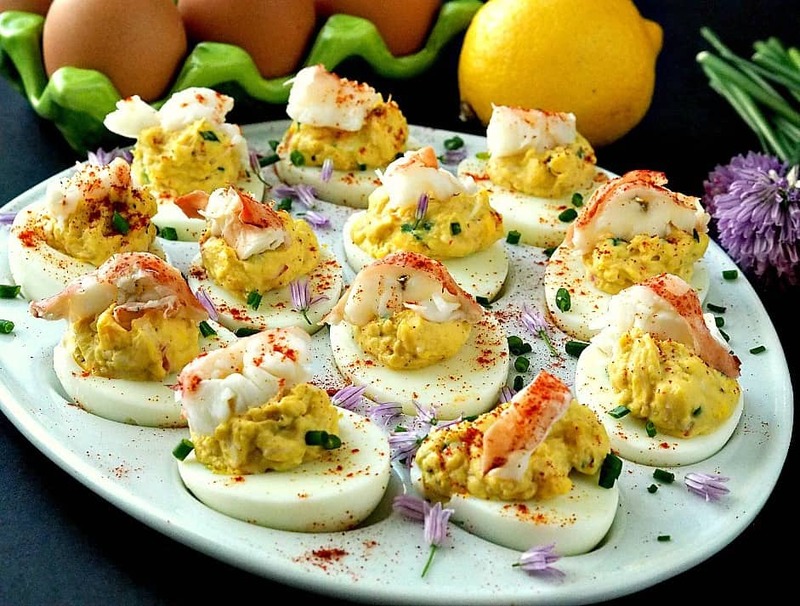 Who doesn’t love a deviled egg but Lobster Deviled Eggs are over the top amazing! These eggs won’t last long, you may even eat them all before serving them! Here I go again. I totally forget what day it is and a holiday weekend? Forget about it. They always seem to sneak up on me! While we are all out enjoying our weekend, hopefully cranking up the grill, I’m making Lobster Deviled Eggs! Funny, right? I fired my smoker up for a party last night, so at least I was productive even though it didn’t stop raining yesterday! We made my whiskey bourbon ribs that I made a few weeks ago! Tasty as ever! Check out the recipe. Memorial Day weekend is the unofficial kick off to summer and lobster, well, just reminds you of summer! Even in Colorado. After a conversation about lobster with a friend back east this week, I had it on my mind. Who doesn’t like lobster and deviled eggs? Not too many people. So I decided to combine 2 of my favorite foods! Tomorrow’s offering for the Memorial Day BBQ will be these lobster deviled eggs. I always bring deviled eggs to parties where I’m not cooking. It’s a sure bet that I come home with a clean plate and no leftovers! I’ll tell ya though, adding lobster to deviled eggs is out of this world and my guess, these gems will be gone in the first 15 minutes of the party! Even if I triple the batch! Sorry stragglers! Give these lobster deviled eggs a try for your next picnic or party. They are simple to assemble and will make your look oh so fancy and gourmet! LOL! As we are all enjoying this holiday weekend, let’s all remember to honor the over 1 million fallen soldiers who died protecting our great country. God bless all of them and their families. PS. Those little purple flowers on the plate, chive blossoms! I have chives coming out of my ears in my garden. They have a subtle chive taste and make a pretty garnish for the plate! Surprise your friends with Lobster Deviled Eggs at your next picnic! They will think that you got all fancy on them when in fact it's so easy to make and really easy to devour! You may want to double or triple this recipe! Leftover lobster tail for garnish. Cook the lobster tails in boiling water for 8-10 minutes. They will turn red. Transfer to a colander and run cold water over the tails. When the tails have cooled enough to handle. Slice a slit down the tails and remove the meat. Place on paper towels and pat dry. Slice the hard boiled eggs in half and scoop out the yolks into a small bowl making sure to wipe off your knife in between cuts. This makes for cleaner looking eggs. Place each half of the eggs onto an egg plate or a regular plate. Break up the egg yolks with a fork until they become crumbly. Add the Worcestershire, mustard, salt, pepper, chives and lemon zest. Stir with the fork until well combined. Finely chop one of the lobster tails and add to the eggs along with the mayonnaise and Tabasco if using. Combine well with a bowl scraper until smooth. Reserve the other tail one for garnish. 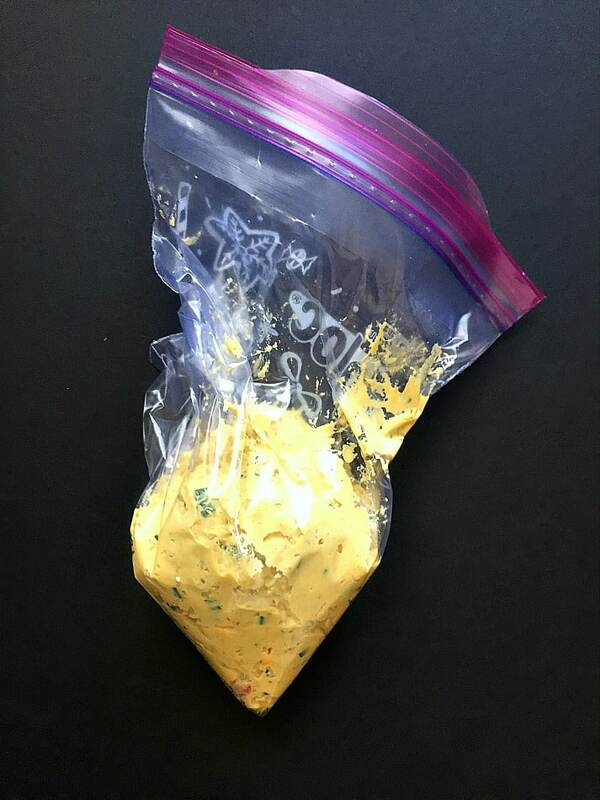 Transfer the egg mixture to a ziplock bag (picture below) and cut a small slit out of one end. Carefully squeeze the mixture into the prepared eggs. Top with chives, paprika and sliced lobster. Tip: I always hard boil a couple of extra eggs just in case they don't peel the way that you like! My grocery store sells frozen lobster tails for $5 a piece. That's what I used for this recipe! Adding the filling to the eggs is as easy as putting the filling in a ziplock bag and cutting a small hole in the tip of the baggie! Easy peasy, easy squeezy! You certainly have taken deviled eggs over the top with this recipe…they look great.